To a beginning seamstress, a sewing machine can be an intimidating thing. Buttons and knobs and levers are on every surface of these contraptions, and the function of each one can impact the finished project. The best way to get over these fears and make a friend out of your sewing machine is to sit down and become familiar with its parts. If you are taking a class, it is likely that your teacher has given you a worksheet to help you learn these parts. Label the stitch length knob. This knob is usually located at the top right of the sewing machine and is generally marked with numbers from one to five. Label the stitch width knob. This is normally located just to the left of the stitch length knob and is normally marked with a series of dashes representing different stitch widths. Label the tension control knob. This knob is generally located on the front of the machine, near the needle. Label the thread take-up lever. The thread take-up lever will be above and slightly left of the needle. It moves the thread up and down and is partially inside the machine. Label the reverse lever or switch. This lever is most commonly found on the front of the machine to the left of the needle, but can sometimes be located on the far-left side of the machine. Label the hand wheel. The hand wheel is located at the top of the far-left side of the machine. On modern machines it will look more like a large knob, but on old machines it is a metal wheel. Label the presser foot. The presser foot is the metal or plastic piece that surrounds the needle and moves up and down to release the fabric or hold the fabric in place. It is a long rectangular piece with a slit in it and gets its name because it resembles a foot. Label the presser foot lever. The presser foot lever is generally found to the rear of the presser foot and needle, but occasionally on newer machines is located to the left. Label the needle plate. The needle plate is the metal rectangle or square built into the machine underneath the needle and presser foot. Label the feed dog. The feed dog is located within the needle plate. It has two rows of what look like little metal teeth. Its function is to move the fabric along while sewing. Label the extension table. The extension table is the bottom portion of the machine that is removable. It provides extra work space when attached and usually contains storage for accessories. Label the bobbin casing and bobbin case. The bobbin casing is the entire portion of the machine underneath the needle. It can be found by removing the extension table. The bobbin case is the small round case that the bobbin is inserted into. It is found in the center of the bobbin casing and is usually metal, but on less expensive machines it is sometimes plastic. Label the shuttle hook. The shuttle hook is the metal piece that sits just below the bobbin case and is shaped somewhat like a hook. Label the bobbin winder. The bobbin winder is located on the far right of the top of the machine and consists of two small levers. Label the thread guide. The thread guide is a small metal loop located on the top of the machine. It is on the left half of the machine, but to the right of the thread take-up lever. When labeling a worksheet, it is likely that the items near the needle and the bobbin will be blown up in a separate area for labeling because there is a lot of detail in these areas. 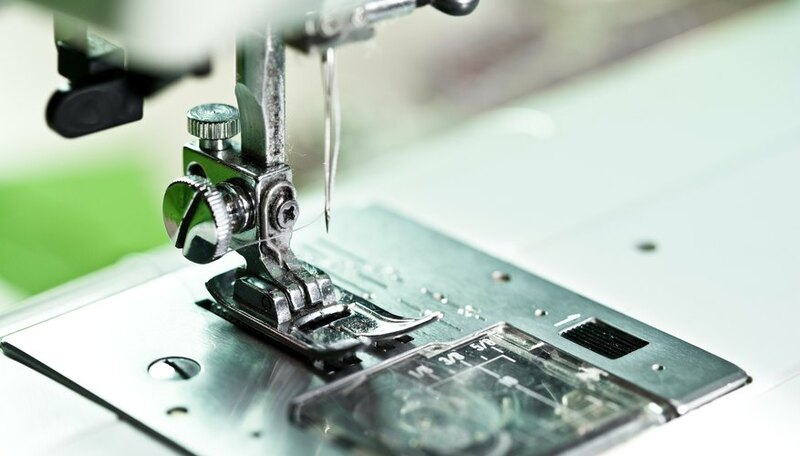 Although there are many universal standards when it comes to sewing machines, some parts will be in a slightly different location depending on the make, model and age of your machine. It is possible that your teacher may use slightly different terminology. If you are attempting to label your machine at home, it is possible that it may have additional features not mentioned here.